We’ve been home from our trip to North America for less than 12 hours and I feel like a walking zombie! 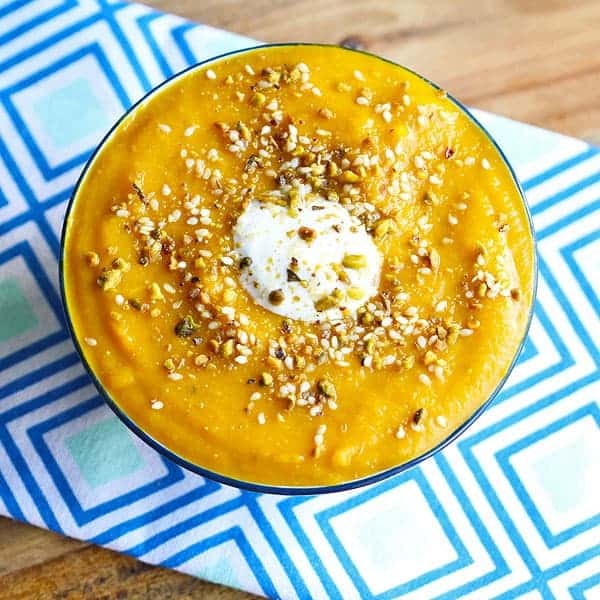 But I’ve been dying to share this tasty moroccan pumpkin and chickpea soup with you guys for awhile now so I will post this then resume napping on the couch for the rest of the day! I came up with this recipe whilst trying to use up a bunch of ingredients just before we left for our trip and was so pleased with how it came together! It’s a winner that I’ll be making again and again! If you already have roasted pumpkin, the soup will come together in less than 15 minutes. That’s my kind of weeknight dinner! Top the soup with some dukkah and a dollop of greek yoghurt and you won’t believe how something so simple can taste so good! This Moroccan Pumpkin and Chickpea soup is gluten free and full of flavour. Preheat oven to 180C / 350F, place pumpkin on a baking tray and cover in 1 tbsp of olive oil. Roast for 20 minutes or until softened and browned. Heat remaining oil in large pot on medium high. Add onions and cook until translucent. Add pumpkin, chickpeas, stock and Moroccan spices and cook for 5 minutes. Using a stick blender, pulse until soup is your desired consistency. Serve with a dollop of Greek yoghurt and a sprinkle of dukkah on top! I usually batch cook pumpkin every week to use in other recipes so generally have some in the fridge which I can easily use in this recipe. This will bring your recipe time down to less than 15 minutes! I used a store bought moroccan spice blend that included ground cumin, paprika, turmeric, ground coriander, garlic and salt. Nutrition information is for one bowl. What is a kent? Or is that the type of pumpkin? If so does it have to be a kent or can I use a different kind of pumpkin and will it affect the flavor of the soup? Kent is a type of pumpkin – you can use any good roasting pumpkin! One of the things I enjoy about visiting other blogs is discovering gems like this! 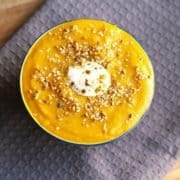 I never thought of combining pumpkin and chickpeas into a soup! Definitely sounds like a recipe to try – thanks for sharing! Awesome Karen! Hope you get to try it! Awesome Emily! Hope you love it! This sounds amazing. What is in the Morrocan spice blend? I wonder if I could get it in the U.S. The one I used is a mix of ground coriander (cilantro), cumin, paprika, turmeric and salt I believe! Thank you! I’m going to find one and try! Looks divine! Ooo this sounds yum! My partner would love this, definitely bookmarking this for later!